I have two ongoing projects up on my wall right now. 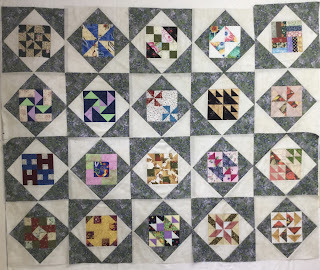 The first is the sampler quilt for the London Friendship Quilters’ Guild, which I designed as a project for the guild to do as a bi-monthly project. It started in September, and will continue on until December of this year. If you are interested, the information for it can be found here. It starts with the most recent block and then goes back. Scroll to the very beginning to find details, should you be interested. Next is my Aunt Lucy’s Medallion, with the first two of the Westering Women blocks in it. I think I’m going to rename it "Aunt Lucy Goes West”. This last is obviously not on my wall, but on the machine. I’m about 2/3rds of the way finished quilting my Friendship’s Garden. 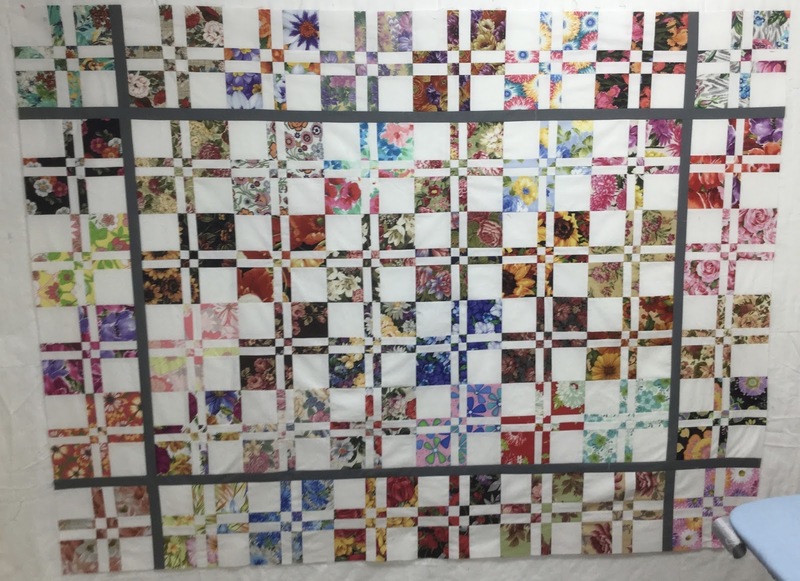 It seemed appropriate to quilt a floral quilt with flowers. You see those two white pentagons sitting there? They fit into that space in between those green stars. Those are the last two!! 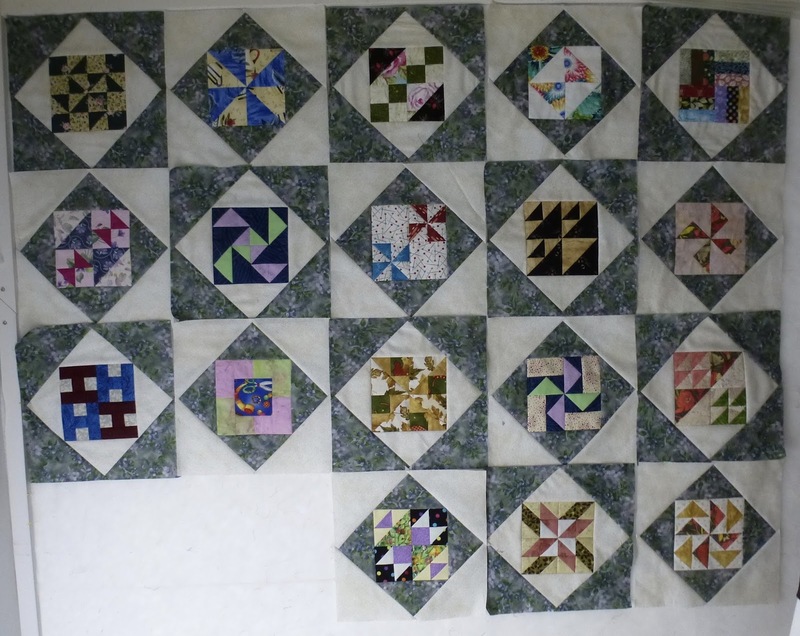 Once those are sewn into place, this project is ready for its next stage...... adding the borders. Can we get a yippee and a woohoo and a happy dance?!? I’m going to make this a short post, so I can get those last two pieces sewn in before the evening is over. As far as stash report goes, I’ve had a few additions, but lots of usage too. I’ve been busy binding and finishing and even making a backing for my D4P. If the weather ever cooperates, I’ll get some pictures. It was lovely and sunny out today, but way too windy for photos. I’m linking up to Kathy’s Slow Sunday Stitching and Judy’s Stash Report and then I’m going back to stitching. 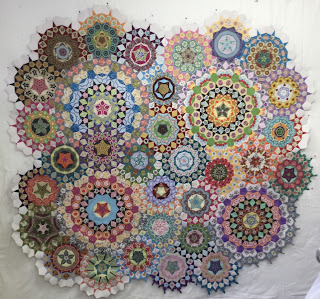 Years ago, back in 2012, I started a quilt called Aunt Lucy’s Medallion. 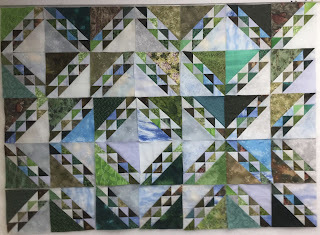 I love sampler quilts, and at first glance, this one was perfect. However, it turned out that the blocks and the finished size of the quilt were smaller than I wanted. Once finished it would measure 55 inches square, not a great size for doing anything useful. So this quilt has sat for the last four years, waiting for an idea on how to make it bigger so that it could be used to keep somebody warm. Fast forward 4 years, and there is a new project on the Barbara Brackman blog called Westering Women. I love her stuff, and I’d wanted to do it, but I’ve put myself on a no starting new projects until some old ones are finished mandate. So I looked at it, sighed and went on. 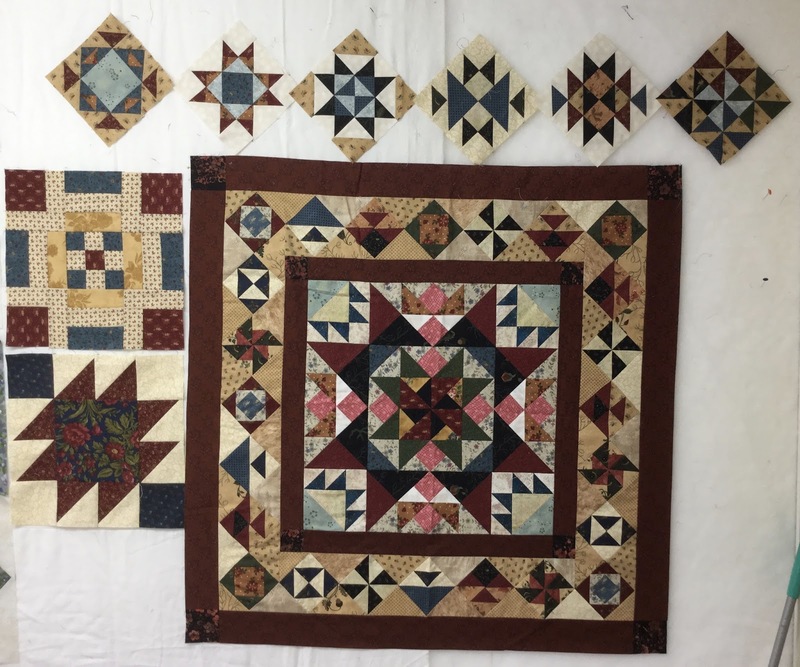 Then yesterday, after seeing the new block for February it suddenly occurred to me that I just might be able to mix the two, Aunt Lucy and Barbara Brackman. 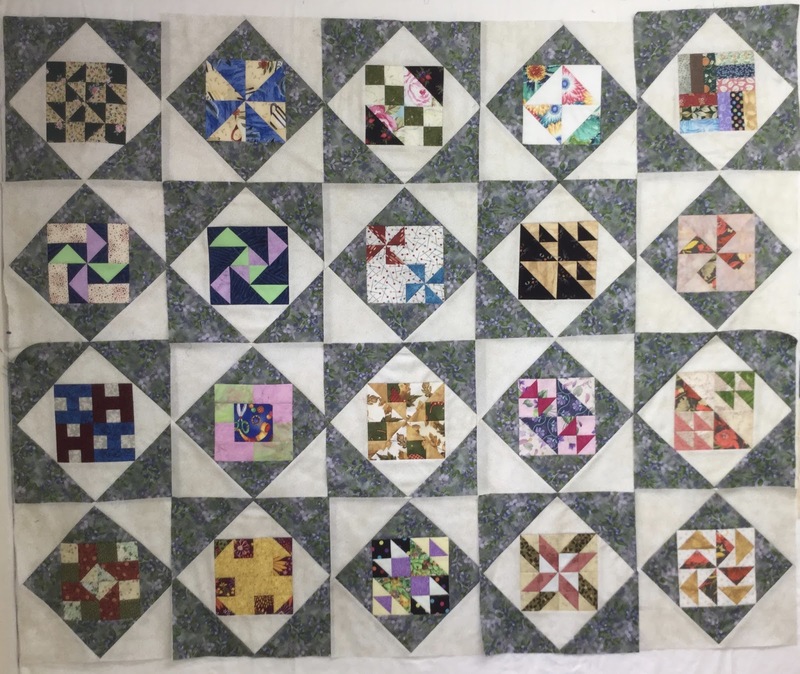 So I did a little playing around in Electric quilt this evening to get an idea of what size it would end up if I added these 12 inch blocks to Aunt Lucy. The result will be a lovely 87 inches square, meaning a perfect sized bed quilt. Here’s the January block all finished. I still have 14 of the 6 inch blocks to do as well. One of those along with the Westering Women block each month should be more than manageable, and it gets another old UFO back into production. It’s a win-win, I think. 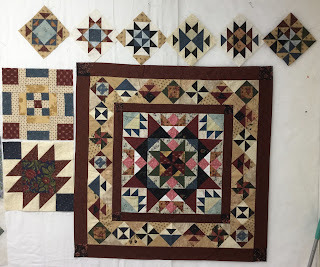 I have a large amount of civil war type fabrics still in my stash, more than enough to finish this, I think, which means more stash reduction..... another win-win. Tomorrow, I’ll play some more with this, along with the blog sampler for the guild. I loaded my Disappearing Four Patch onto the machine today, so I’ll be playing a bit with it as well. I also have the back finished for this, so I just might be able to get this one loaded onto the machine this weekend or maybe next weekend. And that’s all that’s happening around here. I’m linking up to Judy’s Design Wall Monday, and might just do a bit of blog hopping through the other links while I’m there. I’ve picked back up my Traveller’s End Sweater. One of the many bonuses of doing a log is being able to keep track of various projects. Looking back, I remember that I started this sweater over a year ago, messed up the cables and had to rip it out. I restarted it last March, blogged about it here, and then it got put back into it’s bag and it sat until about a week ago. I’ve made quite a bit of progress since then. 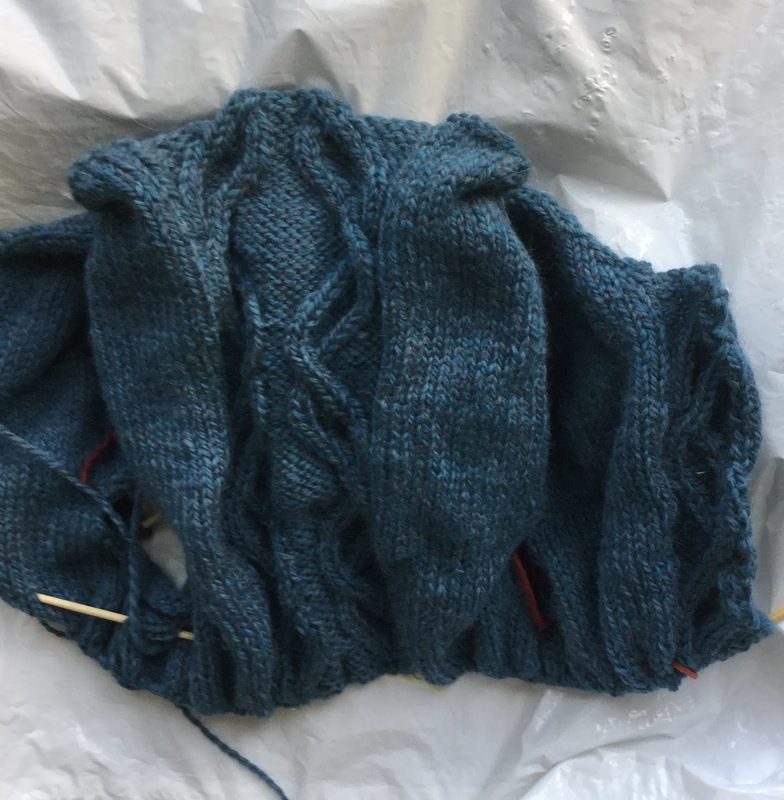 The sleeves are separated off and I’m working my way down the body. I put off picking it back up again, in part, because it was quite a challenge trying to figure out where I’d left off. Now I’m making notes, just in case I have to put it down again and not work on it for a while. It’s not a very good picture. I was trying to get a shot of the front and back cables in the same shot. Turns out I didn’t really get either of them. 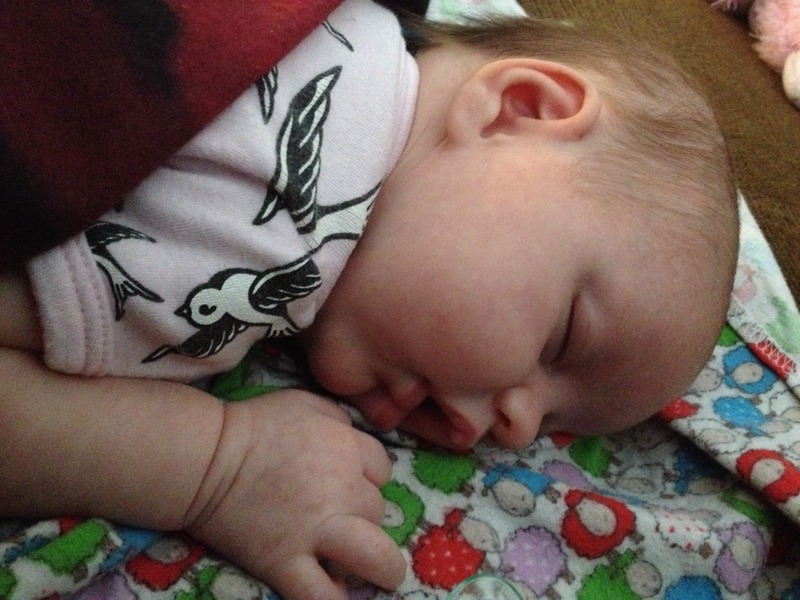 In the meantime, there has been an awful lot of enjoying this precious little girl going on. She’s spending the afternoon with us. We must be pretty boring company, though, because mostly all she's done is sleep. I’m linking up to Judy’s On the needles, before going back to spend more time knitting and getting in some more snuggles when this little one wakes up. I’ve decided to set Northern Tree Line aside for a bit. I’m running low on my selection of light blues and greys that I’m using, so I need to do a road trip for some more fabric. It’s a long weekend here, so everything is closed. Plus, there’s a freezing drizzle advisory out there, so I’d much rather stay in. The fabric shopping trip might happen tomorrow, or it might wait until Friday. It’s not as if I don’t have anything else to work on. Last year, Jannette and I did a swap of large scale floral Disappearing Four Patches. We started off with the middle cut section the blocks finishing to 3/4 inch. Somewhere along the line I messed up the cutting and they started measuring 1 inch finished instead. And then, I messed up even further and made four blocks that finished 1 1/4 inches. All of that messing up caused a problem with putting all the blocks together. So I played around in EQ7 to see if I could come up with a setting design that would keep all the various sizes sorted out in their own sections. This is what I have so far, I’m quite liking how this is looking. There will be another narrow grey border put on this, and then another round of floral blocks added. I had 33 of the 3/4 inch blocks, so they are in the middle and on the two ends, The sides are the 1 inch blocks. I haven’t counted how many of those I have. I might need to make one or two more. 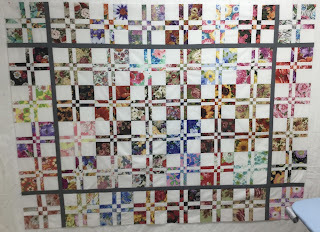 When I get the next row of floral blocks put together, the 1 1/4 inch blocks will be separated out on the outer corners by the narrow grey border. Another day or two should finish this. 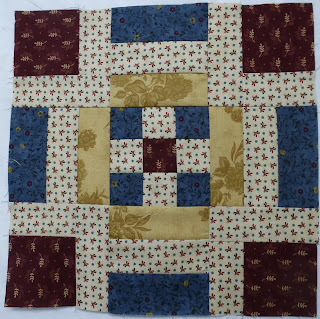 I’m linking up with Judy’s Design Wall Monday. Then i think it just might be time to make something for supper. I have great news.... La passacaglia is all together! All that is left is to put the rest of the white around the edge and it is done. Well, not quite because then I have to attach it to the outer border, but still, it’s so close! Here she is in all her glory. What a long and fun process this has been. But I must confess to being more than ready to have this finished. There wasn’t a lot of stash used up in the last while, and just a little bit added. I’m a day late with this, but at least it’s getting done. I’m not really sure what happened yesterday that I didn’t get to it. 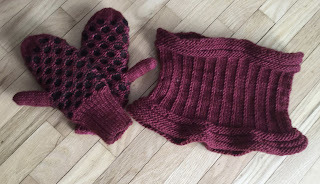 I finished up my mitts. I still had some of that wonderful Malabrigo worsted yarn left, it’s so wonderfully soft, so I found an easy and quick cowl to go with my mitts. It’s called Malabrigo Neck Thingy. I still have some more of that yarn left, but not sure if it’s enough to actually do anything with. Once I finished those, I started on the wrap that I wanted to do. It’s made up of a selection of blue yarns and is knit one row at a time. Each row is begun and ended with a fresh strand of yarn, which creates the fringe. 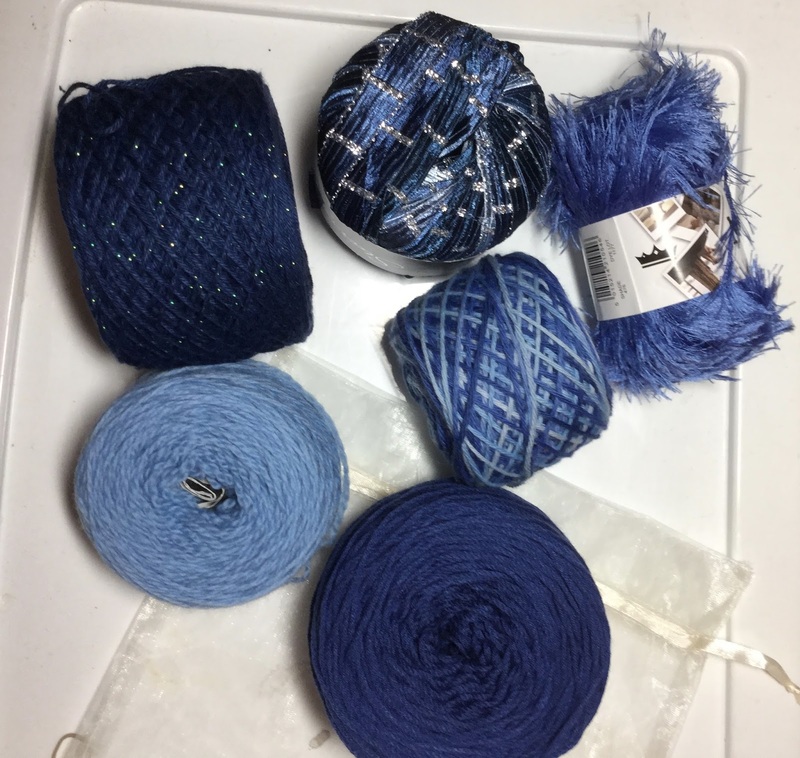 There are five or six different yarns in it, including a ribbon metallic and an eyelash type, which I think is going to make for a fun effect at the end when it is finished. It’s going to be around 60 inches long, before the fringe. I’m not sure how wide I’ll make it. Most likely I’ll just keep going until it tells me it’s finished. It’s fairly loosely knit, using a size 9 mm needle, so I think it will end up being a summer type wrap, good for using in air conditioned restaurants or something like that. I’ve managed to get a bit more done on Northern Tree Line. It’s well over 25% done now. And I have parts done for a bunch more blocks for it as well. I’m hoping to have it finished by the end of the month. I went out and picked up a few more light blues and greys for the backgrounds. I’m running a bit low in variety and the amount of triangles I have to work with. I’m on a push to get some things finished. 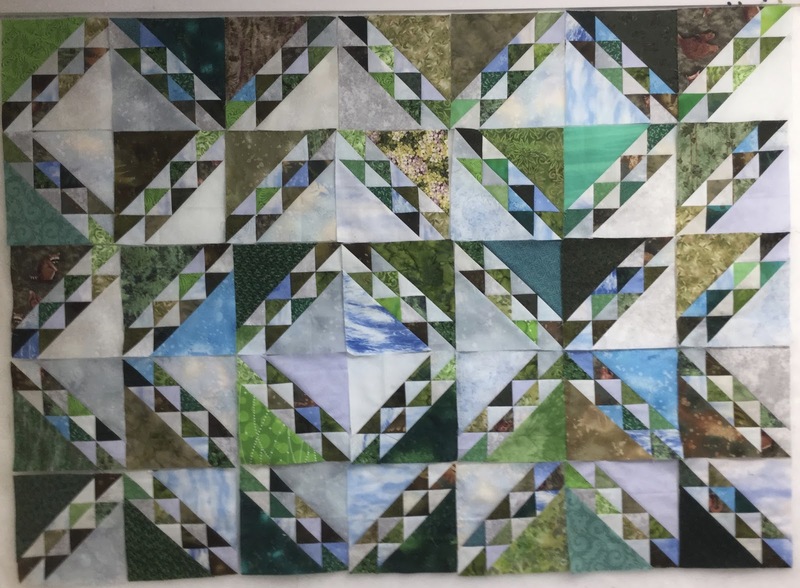 I actually finished adding the binding to a quilt today, but haven’t managed to get a picture of it yet. Maybe tomorrow during the daylight. 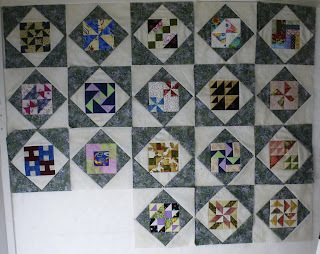 In the meantime, I’m linking up to Judy’s Design Wall Monday. Lots more to see over there, always lots of great eye candy and inspiration. It’s been a pretty lazy day around here today. Not a whole lot in the energy department to spare. I had plans, big plans on getting a lot of sewing done today, but that didn’t happen. I did do a little bit of knitting, though. 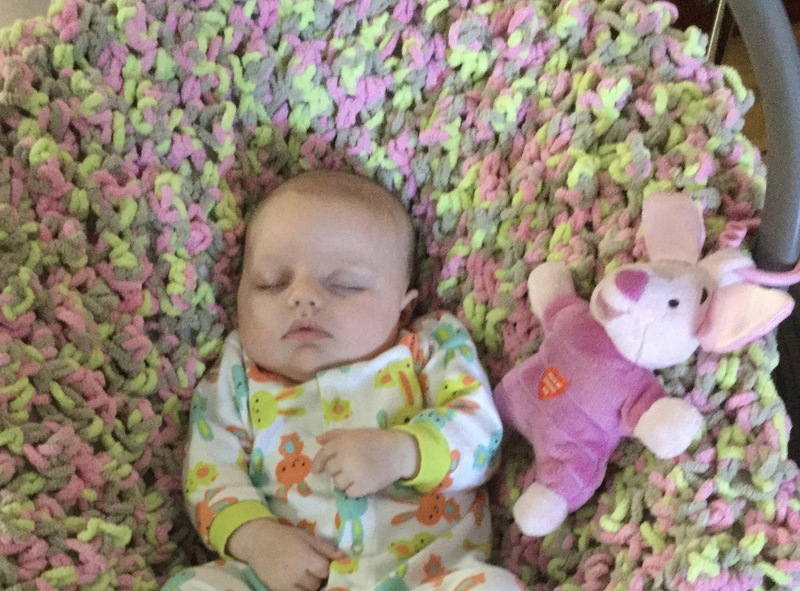 After doing that large Baby Love blanket, I wanted something fast and relatively easy. I decided that I need a new pair of mittens. I do have a lovely thick and warm pair, but they are large and loose, and difficult to drive with. So I started these Newfoundland Mitts last week. 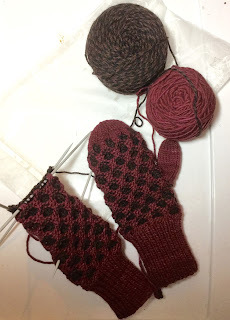 One mitt is completely finished. The second just needs the top decreases done and then the thumb knit in. 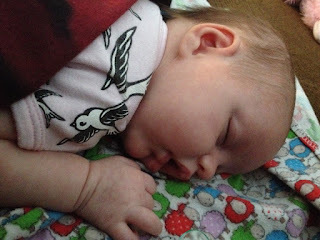 This lovely little girl kept her Mama awake for large amounts of time last night. So she came down and kept me company for the afternoon while her Mama took a nap and I did some knitting. She’s one month old today. That sure went by fast. She’s why I didm’t get much sewing done. But I’d much rather spend the time with her. This same baby girl got me a christmas present before she was even born, and knew enough to make it a gift certificate to a yarn shop..... she's so smart and talented already. (grin) I went out and used it last week and bought a selection of yarns to make a rectangular fringed wrap. It was packaged up in a kit at London Yarns The basic idea is to knit on large needles using plain garter stitch. Each row begins and ends with one yarn leaving a long end at each end that forms the fringe. No ends to tie off. I can use all those blues as often in the wrap as I want, spaced how I like. I think I’ll start this once the mitts are done. It looks like fun. I’m linking up to Judy’s On the Needles, and then I think I’ll do some more knitting. 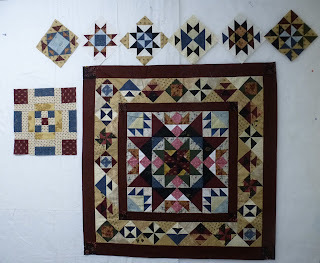 I’m continuing to work on the sampler quilt for the London Friendship Quilters’ Guild Blog. It is now halfway finished, for me at least. These last three blocks take it into the summer now, I think. I just need to get them written up and then scheduled. 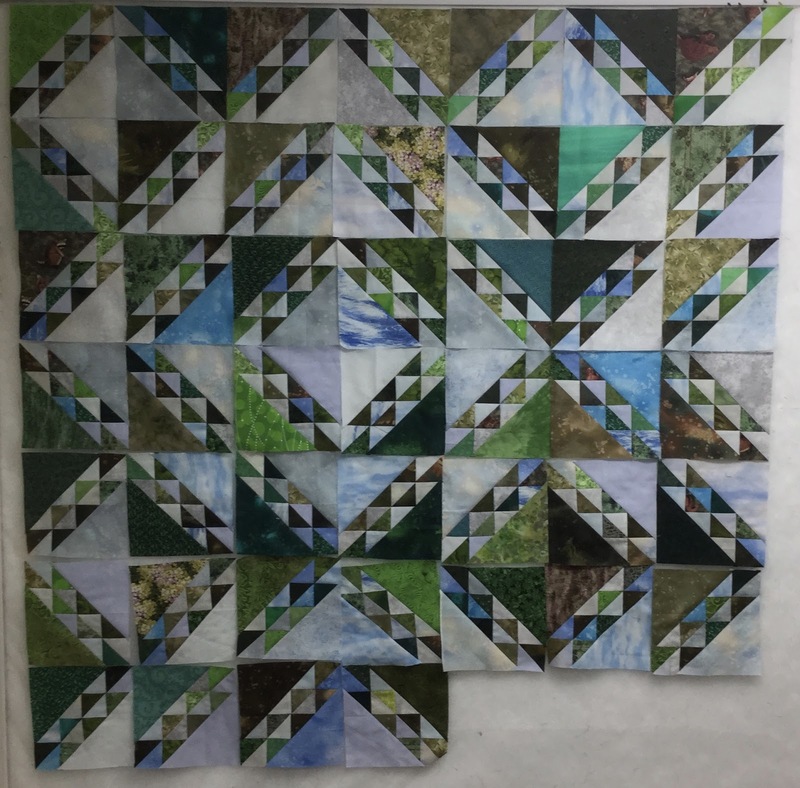 I would like to have it done in time for the guild quilt show in October. That should be doable, depending on what I decide to do about borders. The blocks are 12 inches finished, so without borders it will be 60x84, which would be good enough for a twin bed, I suppose. But I think it needs borders of some sort to finish it. The other thing I’m continuing to work on is Northern Tree Line. I’ve been using the pieces for this as leader/enders for the sampler blocks. I was planning on putting a few more together tonight until I discovered that I’d put some of the green wing triangles on wrong. There aren’t a lot of them wring, maybe 7 or 8, but it was enough to make me decide that it was enough for the day. It won’t take long to rip them reverse sew them, but it can wait until tomorrow. Another hour or so should see at least ten more of these blocks up on the wall. Maybe tomorrow. For now, I’m going to link up to Connie’s Linky Tuesday and the Canadian Needle and Thread Network. After that, it might be some Tv and knitting time.